What's better than visiting cute animals at the zoo? Your little animal getting to play with them! 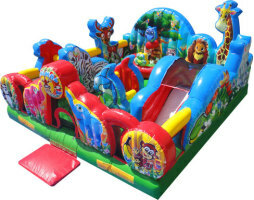 The Animal Kingdom toddler bounce house brings all the fun of the wild to your backyard. Your little one can climb with monkeys, slide with long-necked giraffes, and ride the waves with a new dolphin friend.